A powerful collection infused with the purifying effects of Peppermint, Fennel and Ginger, purposefully blended to cleanse mind, body and soul. The physical and emotional detoxification commences in a re-mineralising bath concluded with a Storm Body Oil or Butter application, completing the decongesting journey. Description: A silky textured body oil that purifies the soul and improves poor circulation. The African herbal fusion provides a detoxifying, decongesting and diuretic effect to help cleanse mind, body and soul. Description: Mineral rich sea salts, containing a powerful blend of cleansing essential oils and complimented with dried Arnica flowers, for a healing bath experience that leaves you feeling physically and emotionally purified while restoring sore muscles and stiff joints to health. Important Ingredients: Atlantic Sea Salts, Fennel, Ginger. 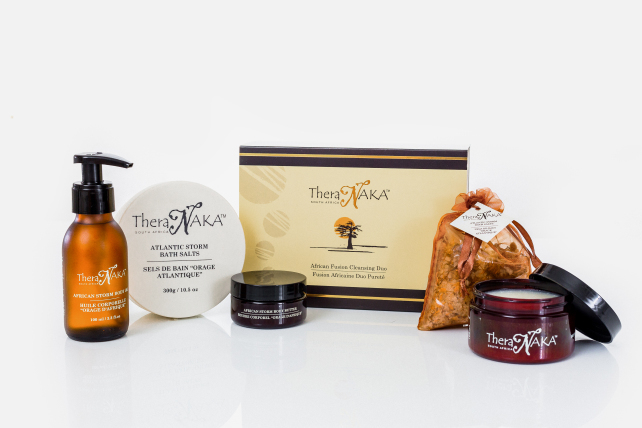 Whether if as a gift for a loved one or just as a treat for yourself, the African Fusion Cleansing Duo is the ultimate luxury at home spa combo to purify and revitalise mind, body and soul, all in the comfort of your own home.